Super Bowl XLIX was carried out on February 1, 2015, at University of Phoenix Stadium in Glendale (Arizona) and determined the champion of the American National Football League (NFL) for the 2014 season. The American Football Conference champion: New England Patriots won the game in front of the National Football Conference champion: Seattle Seahawks with the final score: 28–24. Super Bowl XLIX was the most watched television program in United States history with an average of 114.4 million viewers on NBC and breaking the Super Bowl XLVIII (2014) record, which had attracted an average audience of 111.5 million viewers (more details). Beside the big game, the Super Bowl Ads of 2015 were another important and interesting part of the show. 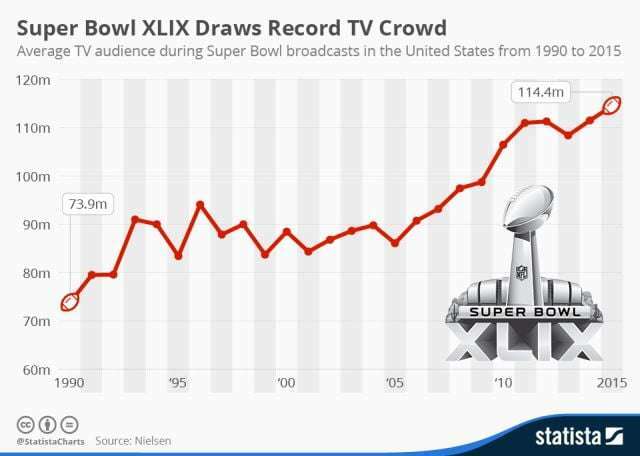 The Super Bowl commercial breaks were always a very good business and for Super Bowl 2015, broadcaster NBC charged $4.4 million to $4.5 million per 30 second spot ($500,000 above the record set by FOX, last year). Which of this Top 20 Best Super Bowl Ads of 2015 do you like the most and why?